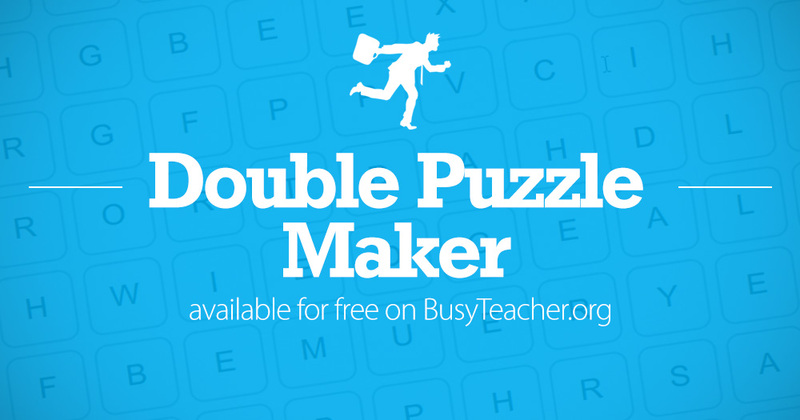 FREE Double Puzzle Maker: Make your own double puzzle now! 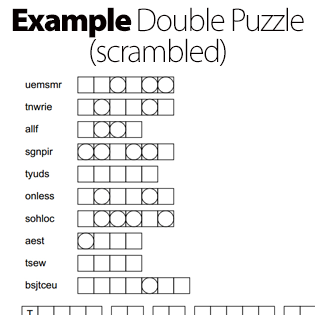 Create your own custom double puzzles with our FREE double puzzle generator. Instantly create awesome-looking printable puzzles for your classroom - your students will love them! The answer sheet is included. What is a double puzzle? 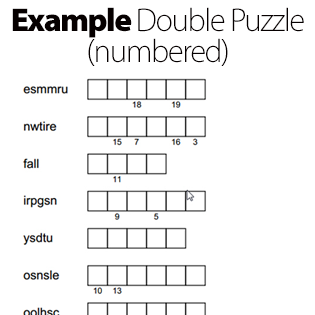 A double puzzle is a puzzle where students first need to unscramble clue words, then use letters from those clue words to decode the final word/phrase. The letters for the final phrase can be numbered, making the Double Puzzle slightly easier to solve. Enter a meaningful title. It will be displayed on the printout. Enter clue words (we recommend 4-8 words), one per line. Students will need to unscramble each clue word and use one letter from it to decode the final word/phrase (see below). Enter the word or phrase that will be created by combining the letters from each of the clue words above. The final word/phrase is made up of letters from the clue words you have added. The letters can be scrambled, giving the solver another challenge, or the letters can be numbered, making the Double Puzzle slightly easier to solve.